This walk: 2012-1-11. Four Winds, Longash Leat, Longash Brook, explosive stores, Hill 60 Quarry, Hollow Tor Quarry, Rundlestone, Tor, old prison boundary stone, DCP prison boundary stone, North Hessary Tor, TV transmitter, PCWW 1917 inscription on North Hessary Tor, TA stones, Tyrwhitt's horse-drawn tramway, Cake Stone, Bronze Age settlement, West Mead Quarry, Red Cottages. Most photos were taken during 'recce' visits on 6 & 7th January. The actual walk took place under a blue sky! Some captions are copied from a similar walk on 16 March 2011. Long Ash Leat, passing Four Winds (car park) - it goes on to run between the two Merrivale stone rows to Longash Farm. Four Winds was the site of Foggintor School, built 1914 (closed 1936), with up to 55 children from the nearby cottages associated with Foggintor and other nearby quarries. Mr & Mrs Stoyle were the teachers, it was a spacious building with a wood block floor and central heating - the pipes were used for warming their pasties! There were periods of closure due to drifting snow and whooping cough. The garden had bees, poultry, a goat and rabbits. Besides the school building there was also the School House, for the teachers. One section of the enclosure was the playing field. The school was run throughout its history by Fred Stoyle, the youngest head-teacher in the country. Their son, Ivan, planted the Christmas tree from 1924 in the school garden and this is the tree that stands there today. After the school closed in 1936, the house was renamed "Four Winds". The building was demolished in 1965. The take-off point on Long Ash Brook for Long Ash Leat at SX 56409 74806. The stream comes from the left and continues, quite reduced, towards upper left while the leat runs towards upper right: this is seen in the following movie. The store (at far right) near Long Ash Brook. Hill 60 Quarry - SX 56985 74773, with the TV mast behind. Another view of Hollow Tor, with a hollow in the middle. Rundlestone Tor, SX 577 746. Old prison boundary stone at SX 57731 74452. The stone bears a broad government arrow head, very near the top of the stone. "There are two bound stones of coarse red granite ..... that are of interest, showing the grooves of feather and tare; one to the south of North Hessary tor at SX 5834 7372, the other to the north between the tor and Rundlestone Tor at SX 577 745. Each has an incised six inch arrow on its east-facing side. ...... Both are, however, on the Forest bounds and are thus misplaced as the original bounds granted to the prison did not extend that far westward ...... " Source: Dave Brewer, Dartmoor Boundary Markers, Halsgrove (2002), p. 260. As previous, showing the proximity of the TV mast. A Directors of Convict Prisons prison boundary stone at SX 57828 74308. Originally, the prison had 390 acres granted but this was extended by 1,000 acres in 1867 when the whole area was marked by these boundary stones. The Directors of Convict Prisons was a body founded in 1850 following the ending of transportation from 1840 and the phasing out of prison hulks in Plymouth, Portsmouth and other places. Source: Dave Brewer, Dartmoor Boundary Markers, Halsgrove (2002), pp. 260-262. The TV transmitter base at North Hessary Tor, built in 1955: an FM radio and television transmitter which uses as aerial a 196.0 metre (643 ft) high guyed mast. Part of the guying system for the transmitter aerial. "PCWW 1917" signifying the limits of the catchmment area of Burrator Reservoir. A view around North Hessary Tor. As previous photo - note the colour of the sky! TA (Tavistock/Ashburton) waymarker stone on the medieval old packhorse track, at SX 56963 73901 - up the slope from Yellowmead Farm. Others were passed at, before: SX 57100 73841, and after: SX 56785 73923. These marked the path between Ashburton and Tavistock, two important stannary towns. Described by R Hansford Worth (1967), Worth's Dartmoor, David & Charles, Newton Abbot, pages 397-402. It seems probable that they date from 1699-1700, according to an item in the Receiver's Book of Plymouth Corporation. Foggintor Quarry, with King's Tor behind. Ruins of the old quarry manager's house. General view inside Foggintor Quarry. Looking into Foggintor Quarry on a very windy day! Another view of the ruins of the quarry manager's house. Foggintor / Hill / Royal Oak Quarry - started by 1820�s from gathering moorstone for the building of Princetown Prison by Sir Thomas Tyrwhitt, owned by Pethick Brothers by 1900, heyday 1840�s employed hundreds of men, it closed in 1906 and the operations concentrated on the more modern Swell Tor. Hill Cottages, at the quarry � by 1850 there were 10 dwellings here, all had very productive gardens, washing lines and privies on the Big Tip. Nelson's Column is made from Foggintor granite. It was also used for kerbs and drains in Plymouth, the breakwater, the defensive forts around Plymouth and the corbels for repairing London Bridge in the late 1890s. The quarries ceased working in 1937. Source: Crispin Gill (1970), Dartmoor - A New Study, David & Charles, page 132. Ruins of Eva's Farm. Source: Kath Brewer (1997), The Railways, Quarries and Cottages of Foggintor, Orchard Publications, Chudleigh, Newton Abbot, map p. 81. A would-be cist? At SX 56710 73978, near Yellowmeade Farm, seen behind. Note the "A" behind the middle fence post - SX 56660 74031, with Yellowmead Farm behind ..... also note the gatepost with gate hangers, possibly this TA stone was moved for use in a gateway? Part of another TA stone, this one is incorporated into the wall. The Cake Stone - SX 56711 74115 (Battenburg). Another view of the Cake Stone. The Bronze Age settlement at SX 5642 7448. Described by Jeremy Butler, 1994, Dartmoor Atlas of Antiquities Vol. 3 - The South West, 1 Yellowmeade (figs. 44.1. - 44.1.1), pages 14-17. Explosives store by West Mead Quarry - SX 56454 74621 (Four Winds behind). West Mead is close to Yellowmeade Farm, what is the significance of "mead/e"? West Mead Quarry - SX 56505 74653 with the trees at Red Cottages in the background. The quarry was owned and worked by Eric Green and his brother until 1966. Eric started at the quarry when he was 16 and it was owned by an uncle. They worked eight-hours a day, using a 4 lb lump hammer. Latterly, they brought granite from Merrivale and worked it here, making headstones and kerb stones. Later, they bought a compressor to make the hard work easier. Eric Green maintained that granite DOES have a grain and that it always beds parallel to the ground, but that it can be split in most directions. Looking across the quarry towards the Four Winds car park, with Great Staple Tor behind (centre). The remains of the smithy walls can be see above the quarry entrance: Source: Kath Brewer (1997), The Railways, Quarries and Cottages of Foggintor, Orchard Publications, Chudleigh, Newton Abbot, p. 79. Fallen tree at Red Cottages, an old Christmas tree similar to that at Four Winds? Blown down in the 1980s. Source: Kath Brewer (1997), The Railways, Quarries and Cottages of Foggintor, Orchard Publications, Chudleigh, Newton Abbot, p. 88. The blow-down may have occurred during the Great Storm of 1987, when a lot of trees, especially at Burrator, were blown over. Red Cottages, SX 566 747 ..... a row of paired gate posts can be seen in front ..... there were 6 buildings with 2 dwellings in each, painted with red lead, built 1847. In 1861 (the census) there were 50 adults and 38 children living here, with 267 souls in the area. Looking along the front of the cottages towards Yellowmead Farm. Close-up between a pair of gateposts. 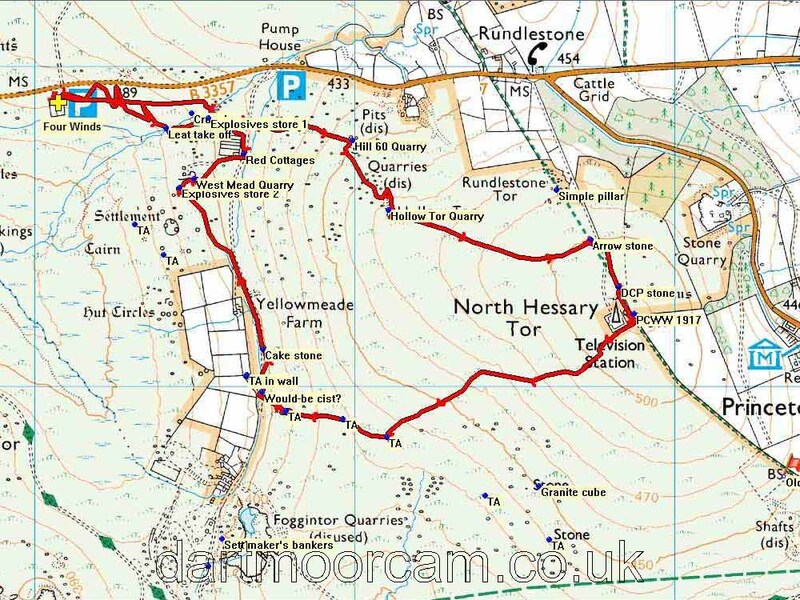 This walk can be approached from Tavistock or from the Princetown direction on the B3357, parking a little east of Merrivale at the Four Winds car park, marked by the yellow cross and the P symbol on the map. The parking area is marked by a stand of trees. Distance - 6.11 km / 3.8 miles.